C.A. Technologies superior spray systems for spraying adhesives are available with the P100G. 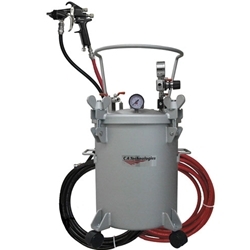 The Laminator is the ultimate spray gun designed specifically for glue/adhesive applications of all types. The gun comes standard with all stainless steel fluid passages. The body and air cap are Teflon anodized for easy cleanup and longer life. Put your 5 gallon pail of adhesive directly into the pressure pot, no liners required.